I love to explore other worlds, be it the past or the future. Some other loves are art, poetry, humor, rainy days, and animals especially canines. Micky Bellsong is looking for a future that doesn't consist of only her good looks. She wants a life of substance and purpose. She wants to believe in herself like her Aunt Geneva believes in her...but she is stuck in her painful past. She finds her purpose in a little girl named Leilani Klump. Leilani, an intelligent and endearing nine year old is counting down the days until she is killed by her serial killer step-father or until she escapes, whichever comes first. Then there is a little alien boy named Curtis, that is on the run from alien hunters and the government--with a Border Collie friend he has picked up on the way. He wants to help heal the world before he leaves the Earth. Somehow, Dean Koontz brings them all together in an incredible story that I couldn't put down. Koontz makes reference later that he designed this book to bring light to something called Utilitarian Bioethics with which he wholeheartedly and passionately disagrees with. He says this inhumane practice seeks to harm the disabled, frail and the elderly. So, that is the underlying theme here. I picked this book up because one of the prompts for a reading challenge was to find a book with the word "one" in it. This particular book captured me because a review said it was about shape-shifters and aliens so I thought it might be up my alley. 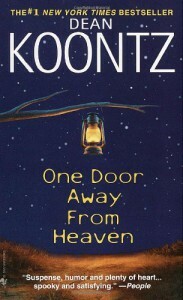 I really liked it and will probably read Koontz in the future. For one, he has the easy 'I was meant to do this' writing style that Stephen King has, and you can see how he made mass market paperback status (as I call it). The characters are incredibly likeable and diverse. The serial killer in this story is not likeable but his part is written very well and you love to hate him (that's the point and it works). I loved loved the two kids in this book. They were endearing and the stuff they said made me smile and broke my heart numerous times and sometimes all at once. I also liked how the book is action packed and constantly moving. For a 600 something page book, it didn't seem lengthy at all and my eyes didn't glaze over from irrelevant points and words . I wanted to pick it up to read again. Ok, so that's all I have to say. The end.